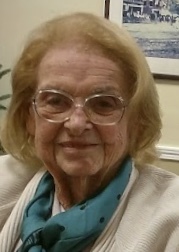 Muriel (Woolley) Smerdon, age 98 of Taunton, passed away on April 8, 2019 at Longmeadow Nursing Home. She was the beloved wife of the late Douglas Smerdon. Born in Fall River, MA, she was a daughter of the late Walter and Edith (Sowerby) Woolley. Muriel moved to Taunton at an early age and called Taunton home for the rest of her life. She loved Taunton and was a member of the Old Colony Historical Society. Her kindness, caring and positive word for everyone defined her life. Muriel could always find the friendship and good in all she met. Muriel is survived by her daughter Beverly Luongo and her husband Richard of North Carolina, granddaughter Erica Luongo Taylor and her husband Alexander of North Carolina, and great grandson Sean Taylor. She was also the sister of the late Walter Woolley Jr. and Corrine (Woolley) Cosgrove. Mrs. Smerdon’s funeral services were held privately.